This item is for preorder - delivery will take place 4-6 weeks from order date. Returns are not permitted on personalized pieces. Please check sizing chart carefully. This unisex crewneck is a 75/25 cotton/poly blend in premium ringspun cotton, and features the popular "RUN DMC" style logo. Medium is 27 inches (68.6 cm) in body length. 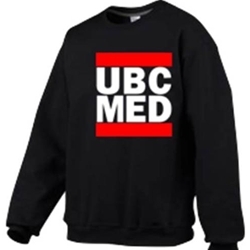 "UBC MED" 2-color logo full-front chest print. In collaboration with the Faculty of Medicine's Medical Undergraduate Program. All profits from this sale go to Hope Air - a charity that provides free flights for Canadians in need such that they can reach their medical treatments and appointments wherever they may be taking place. Please visit www.hopeair.ca for more information.